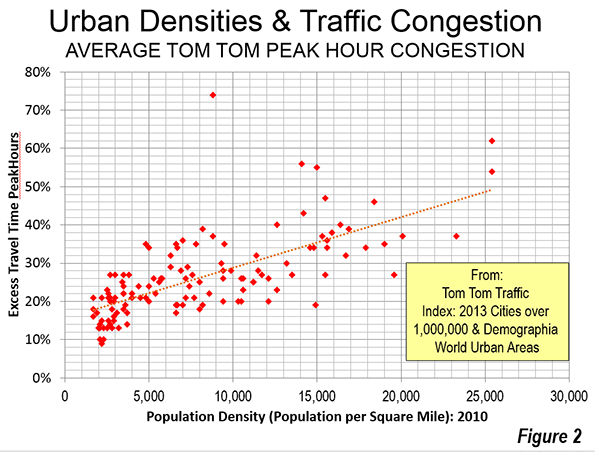 Tom Tom provides all day congestion indexes and indexes for peak hours (heaviest traffic peak morning and evening hour). The traffic indexes rate congestion based on the additional time necessary to make the trip compared to those under free flow conditions. For example, an index of 10 indicates that a 30 minute trip would take 10 percent longer, or 33 minutes. An index of 50 means that a 30 minute trip will, on average, take 45 minutes. This article constructs an average peak hour index, using the morning and evening peak period Tom Tom Traffic Indexes for the 125 rated metropolitan areas with principal urban areas of more than 1,000,000 residents. The peak hour index is used because peak hour congestion is generally of more public policy concern than all day congestion. This congestion occurs because of the concentration of work trips in relatively short periods of time. Work trips are by no means the majority of trips, but it can be argued that they cause the most congestion. Many cities have relatively little off-peak traffic congestion. The two most congested cities are in Eastern Europe, Moscow and Istanbul (which stretches across the Bosporus into Asia). Four of the most congested cities are in China, three in Latin America (including all that are rated) and one is in Western Europe (Figure 1). Moscow is the most congested city, with a peak hour index of 126. This means that the average 30 minute trip in free flow conditions will take 68 minutes during peak hours. Moscow has a limited freeway system, but its ambitious plans could relieve congestion. The city has undertaken a huge geographical expansion program, with the intention of relocating many jobs to outside the primary ring road. This dispersion of employment, if supported by sufficient road infrastructure could lead to improved traffic conditions. Istanbul is the second most congested city with a peak hour traffic index of 108. The average free flow 30 minute trip would take 62 minutes during peak hours. Rio de Janeiro is the third most congested city him with a peak hour traffic index of 99.5. The average free flow 30 minute trip takes 60 minutes due to congestion during peak hours. Tianjin, which will achieve megacity status in 2015, and which is adjacent to Beijing, is the fourth most congested city, with an index of 91. In Tianjin, the peak hour congestion extends a free flow 30 minute trip to 57 minutes. Mexico City is the fifth most congested city, with a peak hour traffic index of 88.5. The average free flow 30 minute trip takes 57 minutes due to congestion. Hangzhou (capital of Zhejiang, China), which is adjacent to Shanghai, has the sixth worst traffic congestion, with a peak period traffic index of 87. The average 30 minute trip in free flow takes 56 minutes during peak hours. Sao Paulo has the seventh worst traffic congestion, with a peak hour index of 80.5. The average 30 minute trip in free flow takes 54 minutes during peak periods. Sao Paulo's intense traffic congestion has long been exacerbated by truck traffic routed along the "Marginale" near the center of the city. A ring road now is mostly complete, but the section most critical to relieving traffic congestion from trucks is yet to be opened. Chongqing has the eighth worst traffic congestion, with a peak hour index of 78.5. As a result, a trip that would take 30 minutes in free flow conditions takes 54 minutes during peak hours. Beijing has the ninth worst traffic congestion, with a peak hour index of 76.5. As a result a trip that should take 30 minutes in free flow is likely to take 53 minutes during peak hour. In spite of recent reports of its intense traffic congestion, Beijing rates better than some other cities. There are likely two causes for this. With its seventh ring road now planned, Beijing has a top-flight freeway system. Its traffic is also aided by its dispersion of employment The lower density government oriented employment core , is flanked on both side by major business centers ("edge cities") on the Second and Third Ring Roads. This disperses traffic. Brussels has the 10th worst peak hour traffic congestion, with an index of 75. A trip that would take 30 minutes at free flow takes 53 minutes in peak hour congestion. Seven of the 10 most congested cities are megacities (urban areas with populations over 10 million). The exceptions are Hangzhou, Chongqing and Brussels. Brussels has by far the smallest population, at only 2.1 million residents, little more than one-third the size of second smallest city, Hangzhou. The most congested US and Canadian cities rank far down the list. 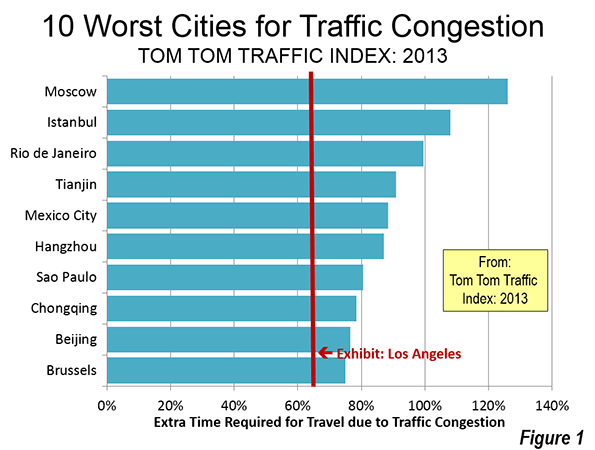 Los Angeles ranks in a tie with Paris, Marseille and Ningbo (China), at a peak hour congestion index of 65. It may be surprising that Los Angeles does rank much higher. Los Angeles has been the most congested city in the United States, displacing Houston in the 1980s. The intensity of the Los Angeles traffic congestion is driven by its highest urban area density in the United States and important gaps in the planned freeway system that were canceled. Nonetheless, Los Angeles is aided by a strong dispersion of employment, which helps to make makes its overall work trip travel times the lowest among world megacities for which data is available). Part of the Los Angeles advantages is its high automobile usage, which shortens travel times relative to megacities with much larger transit market shares (such as Tokyo, New York, London and Paris). Vancouver is Canada's most congested city, with a pea period index of 62.5 and has the 27th worst traffic congestion, in a tie with Stockholm. Vancouver had exceeded Los Angeles in traffic congestion in the 2013 mid-year Tom Tom Traffic Index report. All but one of the 10 least congested large cities in the Tom Tom report are in the United States. The least congested is Kansas City, with a peak period index of 19.5, indicating that a 30 minute trip in free flow is likely to take 36 minutes due to congestion. Kansas City has one of the most comprehensive freeway systems in the United States and has a highly dispersed employment base. US cities also occupy the second through the sixth least congested positions (Cleveland, Indianapolis, Memphis, Louisville and St. Louis). Spain's Valencia is the seventh least congested city, while the eighth through 10th positions are taken by Salt Lake City, Las Vegas and Detroit. There are a number of other highly congested cities that are not yet included in international traffic congestion ratings. Data in the 1999 publication Cities and Automobile Dependence: A Sourcebook indicated that the greatest density of traffic among rated cities was in Seoul, Bangkok and Hong Kong. Singapore, Kuala Lumpur, Jakarta, Tokyo, Surabaya (Indonesia), while Zürich and Munich also had intense traffic congestion. Later data would doubtless add Manila to the list. The cities of the Indian subcontinent also experience extreme, but as yet unrated traffic congestion. It is hoped that traffic indexes will soon be available for these and other international cities. An examination (regression analysis) of the peak period traffic indexes indicates an association between higher urban area population densities and greater traffic congestion, with a coefficient of determination (R2) of 0.48, which is significant at the one percent level of confidence (Figure 2). This is consistent with other research equating lower densities with faster travel times and an increasing automobile use in response to higher densities. At the regional level, a similar association is apparent. The United States, with the lowest urban population densities, has the least traffic congestion. Latin America, Eastern Europe and China, with higher urban densities, have worse traffic congestion. Density does not explain all the differences, however, especially among geographies outside the United States. Despite its high density, China's traffic congestion is less intense than that of Eastern European and Latin American cities. It seems likely that this is, at least in part due to the better matching of roadway supply with demand in China, with its extensive urban freeway systems. Further, the cities of China often have a more polycentric employment distribution (Table). Both of these factors, high capacity roadways and dispersion of population as well as jobs are also important contributors to the lower congestion levels in the United States.